Six packages with the drug were located inside one of the bathrooms of the ship, but there are no detainees. Six packets of drugs, apparently cocaine, were found inside a bathroom of a cruise ship docked in Cozumel. It was the cruise MSC Divina, of Italian citizenship and coming from the Cayman Islands. The events occurred when the customs department was alerted about the existence of a suspicious package, information that was sent to the Office of the Attorney General of the Republic (FGR), the body that led the operation through the Federal Ministerial Police, the Secretariat of the Navy, Federal Police and personnel of the Tax Administration System. Usually on cruise ships, they do not let people from outside the ship enter, unless there is a complaint, what happened in this case and in the review of the ship found the existence of six packages wrapped inside a bathroom, with the characteristics of the alkaloid cocaine. The cruise MSC Divina sailed yesterday to Miami with the crew and passengers who arrived on the island of Cozumel, while the alkaloid was available to the FGR. This is an unprecedented seizure in Cozumel, at least in this decade, since the most similar was recorded in 2011, when American tourists tried to board a hotel-ship of the Royal Caribbean chain with a few grams of marijuana, a drug that It was seized. It was affirmed that the FGR will continue with the investigations and in case of finding those responsible for this transfer of drugs – found in a bath of the ship – they could give part to the authorities of Miami. 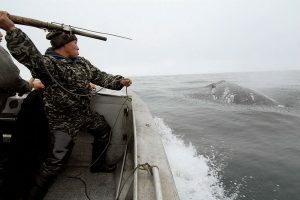 So far it is presumed that someone would have gone up with the intention of making a transfer to the United States, circumventing the security controls of the ship and Mexican authorities; the finding was reported by customs agents. The data obtained establishes that personnel from Customs and the National Institute of Migration (INM) gave notice to the Ministerial Police of FGR, that inside some bathrooms of the Divine MSC, there was a suspicious package of what they thought could be drugs, and that Some unknown person, who could be a passenger or crew, intended to traffic to the United States. 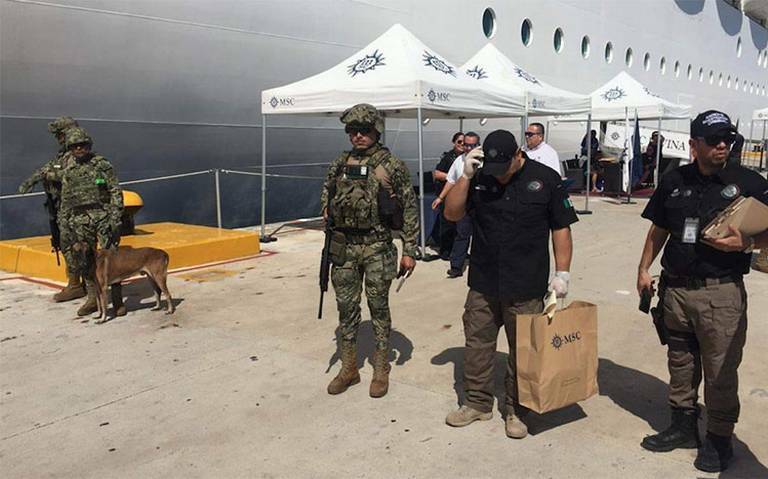 That motivated an operative in the pier of Punta Langosta, where the cruise in question was docked, involving agents of the Tax Administration Service (SAT) and elements of the Secretariat of the Navy of Mexico, but the seizure was the responsibility of the FGR . The ministerials would have found inside a bathroom, apparently public, on the same cruise, six packages covered with plastic under pressure, which contained white powder with the characteristics of cocaine. There were no detainees, because the packages had been abandoned by those who entered them on the cruise, managing to evade all the security controls of the shipping company and the same Mexican federal authorities that were on the dock, since the data indicate that cocaine It was found inside the cruise, not at the moment when someone tried to introduce it to the ship. It transpired that the cruise travelled from the Caribbean and arrived at 9:00 am, to sail from the island at 18:00 hours, bound for Miami, Florida. The MSC Divina cruise has a capacity for 4,343 passengers, as well as 1,370 crewmembers. The cost of the trip through the Caribbean, sailing from Miami to return to the same port is 16 thousand 699 pesos per person and has various restaurants, swimming pools, nightclubs and a theater. It is worth mentioning that Cozumel is the world’s leading cruise ship leader, arriving at this island about 4 million tourists a year.